people can remain living independently in the comfort of there own home. My Name is Zlata, Director of Independent Life Home Care. 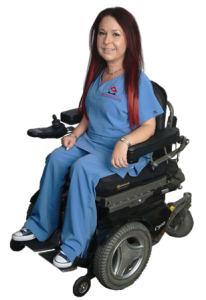 Like our clients who depend on our team for a variety of needs, I also have a disability. I know just how important it is to work with a home care professional you trust; their kindness and expertise are crucial components in your care. Independent Life Las Vegas allows your loved ones to live independently and comfortably while meeting all of their in-home care needs. Our expert, trained and compassionate caregivers provide Alzheimer’s care, dementia care, respite care and any other in-home care assistance you may need. This will enable your loved one to continue to live safely at home while providing you with peace of mind. You will know that the in-home, elder care your loved one is receiving is compassionate, flexible and convenient. In-home care and senior home care services are provided by Independent Life Las Vegas, which is one of the leading senior home care services agencies across America. Independent Life Las Vegas is flexible and we are committed to treating your loved one as if they were one of our own. We carefully and thoughtfully create a care plan for your loved one based on their needs, abilities and goals in the way that is most comfortable and convenient for you and your loved one. Caring for elderly family member can be exhausting, stressful and time consuming. That is why making decisions about in-home elder care is such an important step in your family’s life. We will take the time to thoroughly explore your questions and understand your situation so that your concerns are eased. Independent Life Las Vegas will honor your choices and treat your loved ones with the care and respect that they deserve. If you are looking for home health services in an area other than Independent Life Las Vegas, please look to see what is available from Independent Life in an area near you. We invite you to take the next step in caring for your loved one by learning more about our in-home care, senior home care and elder care services by visiting our website now!